Coincidentally, I found they were written by the same person, Norman Bancroft Hunt. This book is denser than the other--probably because it's covering more cultures over more years. I've read only the introduction, which covers the Paleo-Indians' arrival in the Americas. But it raises some interesting points. This book was published in 1991, but it doesn't feel dated. Hunt's position is that the first Americans came 35,000-40,000 years ago via the Bering Strait. The dates are consistent with the latest thinking, but I think many experts would say people came by several routes, not just one. Hunt notes that "powerful ultra-conservative elements," led by a scientist named Ales Hrdlicka, claimed that Paleo-Indians arrived no earlier than 8,000 years ago. Possibly as recently as 4,000 years ago. We now know this claim is ridiculously far off the mark. But I'm not sure I've ever heard the people making this claim lambasted as "ultra-conservative." It's an acknowledgment that many scientists have political and cultural biases. Specifically, biases against recognizing Native people as full-fledged humans with a deep past. If the Paleo-Indians came over 35,000 or more years ago, they wouldn't have had the East Asian mutation. They wouldn't have looked like the Japanese Ainu or any other Asian people. Later waves of migrants may have brought the characteristically Asian traits to America. But the very first Americans could've looked like anybody. Other than a couple of paragraphs about buffalo jumps, Hunt doesn't make any claims about Paleo-Indians wiping out the continent's megafauna in a fit of savagery. In fact, he lays the blame squarely on climate change. America was much more lush 12,000 years ago, he writes. Much of the continent was like the American South is now. This was fertile ground for giant mammals like mammoths and mastodons, which used their tusks to uproot the vegetation. Then the climate dried up and the lush vegetation disappeared. America became like it is now--desert in the West, prairie in the Midwest, etc. Giant herbivores like mammoths couldn't cope with this, so they slowly died out. 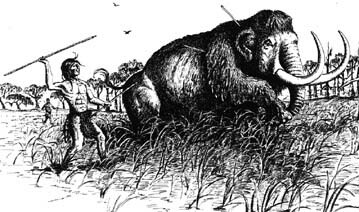 Their deaths triggered the deaths of the giant predators such as the saber-toothed cats. The effect cascaded through the food chain. Larger animals became extinct and were replaced by smaller ones. This megafauna extinction happened worldwide. Mammoths presumably died in Europe and Asia for the same reasons they died in America. About the only factor that could've killed animals around the globe was climate change. Moreover, humans had been present in the Americas for at least 23,000 years before the extinctions began, according to Hunt. By that time, the animals would've adapted to the human presence. The two groups--animals and humans--would've reached an equilibrium. True, a final wave of arrivals after the last Ice Age could've upset the balance. But Shepard Krech and his ilk claim the animals didn't recognize the humans or the threat they posed. If humans had been present for millennia, I doubt the animals would've been surprised and overwhelmed by the newcomers. Anyway, Native Americans looks to be another good read. I'll let you know if I learn anything interesting.